Sandra Samir lifted her second junior title of the year as she won the African Championships in Casablanca yesterday. The 16-year old was the top seed and was fully expected to be the class act in this field and she did not disappoint. She barely had to break sweat in dispatched the fourth and third seeds, Lesedi Sheya Jacobs and Theresa Alison van Zyl respectively, in consecutive rounds to reach the final, where she met fellow Egyptian, Mayar Sherif. It was the first time that she was challenged, but after splitting the opening two sets, she pulled away to clinch a 6-3, 2-6, 6-0 victory and defend the title that she won twelve months ago. Opponents in the singles final, the two Egyptians teamed up to lift the doubles title as they crushed all-comers to win the title without dropping a set. Rita Atik and Lina Qostal were the opposition in the final, but the Moroccan pairing were able to win just two games. Sydney Arnea Riley won her first ever junior title in Jalisco as she battled past the local favourite, Daniela Morales Beckmann. Riley had to overcome a long semi-final against the in-form Costa Rican, Ariana Rahmanparast, to reach the final and she showed her stamina in beating Morales Beckmann 6-7, 7-6, 6-4 to lift the trophy. It was also a dream run for the junior #773 ranked Mexican, who had never passed the quarter-final stage in a junior tournament until this moment. There was further heartbreak for the Mexican crowd as the top seeded pair of Jessica Hinojosa Gomez and Ana Luisa Perez Lopez were beaten in the doubles final by Megan Horn and Ariana Rahmanparast in a third set tiebreak. 14-year old Brit, Jodie Anna Burrage, lifted her first Grade 4 title and her second overall junior title in Oslo. It was a dominant week for Burrage as she dropped just fifteen games in her five matches and never looked like dropping a set. 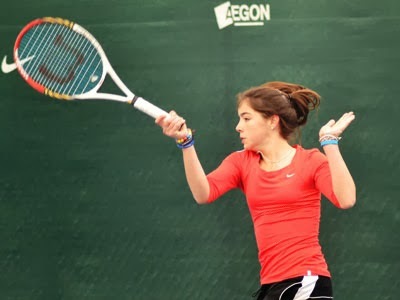 The highlight was a 6-2, 6-1 victory over the second seed, Berfu Cengiz, in the semi-final and she showed no sign of nerves as eighth seed, Ulyana Grib, was beaten 6-3, 6-4 in the final. Grib would suffer further disappointment as she lost the final of the doubles competition with her partner Marina Darzyan as they were beaten by the fourth seeded home pair of Alexandra Borg and Pauline Jahren. Tamara Zidansek won her first Grade 4 tournament and first junior tournament in almost 18 months as she overcome Theo Gravouil in the final in Cadolzburg. Her half of the draw opened up as top seed, Karoline Kurz, lost in the first round and the fourth seed took advantage, dropping just one set on route to the title. Her opponent, Gravouil, can also be pleased with her week as she reached her first career junior final. The doubles final was won by the Swiss-German pairing of Jessica Bruehwiler and Anna Gabric, who overcame the Swiss pair of Tamara Arnold and Medina Sahinagic in the final. In a tournament dominated by the Russians (with seven of the eight quarter-finalists), it was fifth seed, Tina Bokhua, who won her first junior title in her fourth final. She won in style, not dropping a single set, although she did play just one seeded player on her run to the title. The final victory was a straight-forward 6-4, 7-5 win over the unseeded Natalia Belova, who had beaten the third seed on route to the final. Belova would take home a trophy though as she teamed with fellow Russian, Polina Bakhmutkina, to beat Darina Leonenko and Aleksandra Vostrikova in the final of the doubles. Elizaveta Kulichkova - Star of the Future?